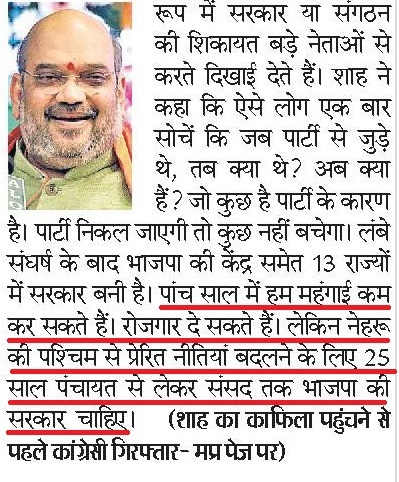 Home Media Times of India lies brazenly, falsely claims Amit Shah talked about "Achche Din in 25 years"
One would imagine, this makes for a compelling proof to say that Amit Shah has said these words, thereby clearly showing that the NDA Government has gone back on its “Achhe Din” promise. But Times of India has other ideas. This statement though makes a rather logical point that India or for that matter any country in similar situation as India, cannot become a world leader in just 5 years. So, from a sensationalist headline and opening paragraph, we come to a rather logical statement. He elaborated that in its first five-year rule, the BJP government could reduce inflation, ensure secure borders, make a strong foreign policy, achieve economic development, provide jobs and remove poverty. “But the BJP needs to win elections at every level, from panchayat to the Lok Sabha, for 25 years to take India to the No. 1 position in the world,” he added. Again extremely logical statement that basic goals can be achieved in 5 years, but for India to reach number 1 position in the whole world, 25 years would be needed. Also key here is while in the opening paragraph it is said “Acche Din in 25 years”, the third paragraph says “India will be no.1 in 25 years”. So why this contradiction? Which part of the Times of India article is true? This is exactly what Times of India says in its third paragraph, and since two media houses are quoting the exact same thing, we can broadly conclude this was indeed said by Amit Shah. And does the Dainik Bhaskar piece also mention “Achhe Din” in 25 years? See for yourself here. Nowhere in Dainik Bhaskar’s piece does the phrase “Achhe Din” even find a mention! Friends, If India has to reach the topmost position in the entire world, then a 5 year Government cannot do anything. When I say “a 5 year Government cannot do anything”, it doesn’t mean we *unclear* from things. We can reduce inflation in 5 years, we can secure our borders in 5 years, we can redraft foreign policy and restore India’s honour, we can have economic development, we can also give jobs to youth, poverty can also be banished, unemployment can also be ended. But in 5 years, we cannot fulfill our dream of making India a “Vishwaguru”. It can only happen when we get control from Panchayat to Parliament, like Congress got from 1950 to 1967. Similarly, from today till 25 years hence, BJP should win all elections from Panchayat to Parliament, only then we can achieve this goal. We have also contacted the writer of the Times of India report asking for evidence to back his claims and the report will be updated suitably in case any clarification is given to us. Will Sachche Din in Times Group come after 25 years?